Big news, horror fans!! 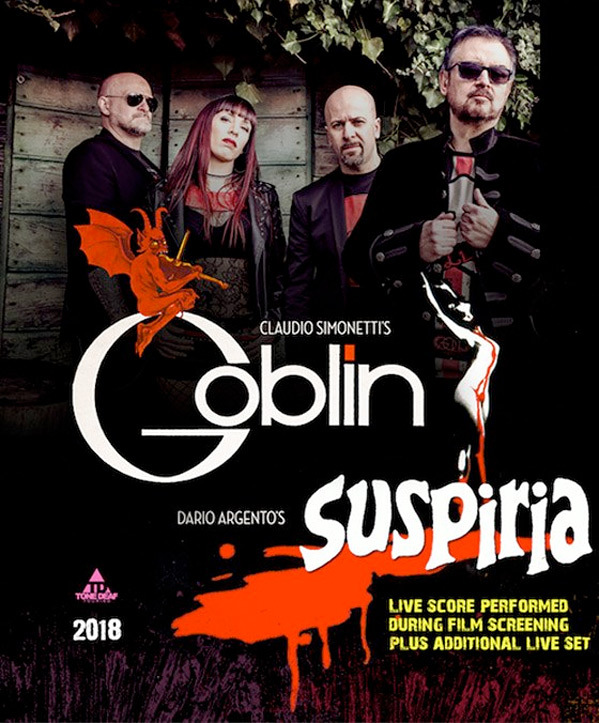 The Italian rock band Goblin has announced that they will be playing special live-score shows of Suspiria throughout America (and in the UK) this fall. This is clearly in connection with the release of Luca Guadagnino's upcoming remake of the original witch horror Suspiria, directed by Italian horror master Dario Argento, and first released in 1977. Amazon Studios has Guadagnino's new Suspiria scheduled for release in theaters starting November 2nd later this fall. Goblin has announced a tour that begins on August 5th in the UK, continuing in the US beginning on October 28th in Baltimore, MD at the "Days of Darkness Festival". They will then play shows throughout October and November, touring around. Here's the promo flyer released by the band for the upcoming live show tour. Each show will feature a live performance of the score with the film, then an additional set performed by the band. More details to come. Thank you to Bloody Disgusting for the tip. There are not many other details, and it doesn't seem like tickets are available yet. The full list of dates and cities can be found on B-D. They will be playing in Austin, Texas on November 2nd when the new Suspiria film opens. Goblin is an Italian progressive rock band that first launched in 1972, known for their Argento scores (including Deep Red, Zombi, and Sleepless). The new film will feature a score by Thom Yorke, of the band Radiohead. It has become a regular occurrence to see live-score versions of films, sometimes with the original composer/musician, sometimes with a local orchestra or touring group. This announcement is particularly exciting because Goblin's very moody score for Suspiria is iconic, and it can be replicated, but it's hard to top (similar to Vangelis' score for the original Blade Runner). The Metrograph cinema in New York showed a "recently discovered, uncut Italian 35mm print" of Argento's Suspiria on the big screen last year. This live performance is another great tribute to this cult horror classic.